April 7th is National Burrito Day. You don’t have to twist most arms to enjoy one. A step back in history: In 1519 the Spanish conquistadors arrived in what today is Mexico, bringing with them wheat flour and pigs. This enabled flour tortillas and carnitas. Flour tortillas are more flexible than corn tortillas, and therefore, easily rollable. A modern question is: Why are carnitas in a flour tortilla called burrito—“little donkey” in Spanish? No one knows for sure, but the leading guess is that it was named for its shape, which resembles the bedrolls carried on the back of donkeys. While the modern burrito is no more than 100 years old, Mesoamericans often rolled their food in tortillas for convenience (no dishes or utensils needed). Avocados, chili peppers, mushrooms, squash and tomatoes were sliced and rolled. The Pueblo peoples of the Southwestern U.S. were even closer to the mark. They made tortillas with beans and meat sauce fillings, prepared much like the modern burrito [source]. That there was a rolled food called burrito in 1895 dispenses with the folk tale of a man named Juan Méndez, who sold tacos from a street stand during the Mexican Revolution (1910–1921) in Ciudad Juárez. As he used a donkey for transport, customers began to call his tacos “food of the burrito,” the little donkey, and the name eventually stuck. Food historians opine that the modern burrito may actually have been invented in the U.S., as a convenient lunch for Mexican agricultural workers. The Modern Burrito: Born In The U.S.A. The precise origin is not known, but it is generally believed to have originated in a Mexican-American community in the U.S., among farm workers in California’s Central Valley (Fresno, Stockton). According to Wikipedia, the farm workers who spent all day picking produce in fields would bring lunches of homemade flour tortillas, beans and salsa picante (hot sauce)—inexpensive and convenient. 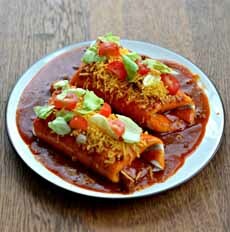 Burritos first appeared on American restaurant menus in the 1930s, beginning with El Cholo Spanish Cafe in Los Angeles. El cholo is the word used by Mexican settlers in California for field hands. Burritos were mentioned in the U.S. media for the first time in 1934, appearing in the Mexican Cookbook, a collection of regional recipes from New Mexico by historian Erna Fergusson. It was “inspired by the delight and enthusiasm with which visitors to the Southwest partook of the region’s cuisine.” You can still buy a copy. 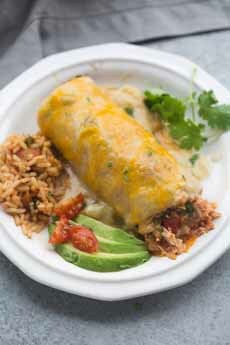 In 1999, food writer John Mariani wrote that “What makes burritos different from most other Mexican-American foods is the metamorhpasis of this dish. In Mexico, meat and beans or refried beans can be the only burrito fillings. In the U.S., things get more elaborate. American burrito fillings may include not only the refried (or other) beans and meat, but rice, lettuce, salsa (pico de gallo, salsa picante), guacamole, shredded cheese (cheddar or jack), sour cream and vegetables. Burrito sizes vary—they’re super-sized in the U.S., up to 12 inches. You can also find them in 9- and 10-inch diameters. 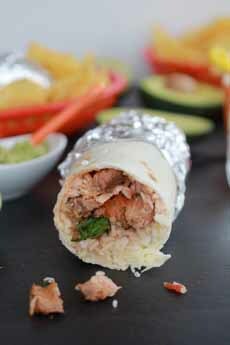 In 1964, Duane R. Roberts of Orange County, California sold the first frozen burrito. He made so much money that he was eventually able to buy Riverside’s iconic Mission Inn and refurbish it. The U.S. even developed the breakfast burrito, and astronauts eat them in outer space! Steak and cilantro burrito. Here’s the recipe from Half Baked Harvest. 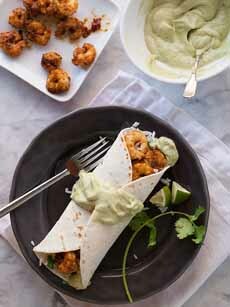 Gourmet burrito: grilled shrimp and avocado cream. Here’s the recipe from Foodie Crush. Breakfast burrito: Now an American staple, it first appeared in 1975. Here’s a recipe from She Wears Many Hats. Chipotle restaurants brought burritos and burrito bowls across America (photo courtesy Chipotle). Wet burritos: definitely not grab-and-go. Here’s the recipe from Hezzi D’s Books & Cooks. Not wet, but smothered in a poblano-cheeese sauce. Here’s the recipe from Tastes Better From Scratch. Tia Sophia’s, a Mexican café in Santa Fe, New Mexico, claims to have invented the original breakfast burrito in 1975, filling a rolled tortilla with bacon and potatoes. It was served “wet,” topped with chili and cheese. Many Americans had their first breakfast burrito when McDonald’s introduced the Sausage Burrito in 1991: a flour tortilla, sausage, American cheese, scrambled eggs, onions and peppers. Taco Bell didn’t introduce a breakfast burrito until 2014. Which brings us to the choice of the grab-and-go burrito, eaten by hand, and wet burritos, on a plate covered with sauce and other garnishes, eaten with a knife and fork. And then there’s the burrito bowl, pioneered by Chipotle: the fillings of a burrito eaten with a fork, no tortilla. Chipotle now sells more bowls than conventional burritos. The bowls save 300 calories [source]. 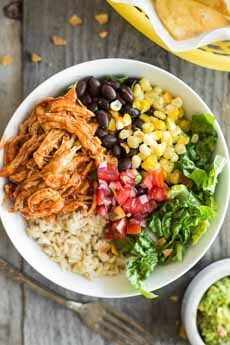 A burrito bowl provides the fillings without the tortilla. Photo courtesy Simply Recipes. 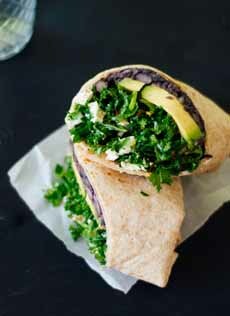 Trendy and vegan: a kale burrito with black beans and avocado. Here’s the recipe from Cookie and Kate. We’re not the type to put gold leaf, foie gras and sturgeon caviar on food just to create the world’s most expensive [fill in the blank]. But we do enjoy the luxury of playing with top-drawer ingredients. Rice and beans are fillers. You can make a burrito without them, or can serve them on the side. Or, you can take them up a notch with fancier rice and beans. Here are typical burrito ingredients and their upscale variations. If you don’t like our ingredients, tell us what you’d use instead. Beans (kidney, pinto, refried) > heirloom beans: cranberry, scarlet runner, yellow Indian woman…or lentils. Carnitas (braised pork) > pork belly. Cheese (cheddar or jack) > gruyère. Diced tomatoes > heirloom tomatoes, marinated yellow cherry tomatoes, fresh tomato sauce (diced tomatoes with seasonings), tomato jam. Chicken (thigh meat): ditto, with the skin removed, crisped and tossed into the burrito (cracklings). Cilantro > cilantro plus basil and parsley. Diced onions > Caramelized onions, onion preserves. Fried fish > roasted or grilled salmon. Garlic > roast garlic cloves, whole or mashed. Iceberg or romaine lettuce > butter lettuce, curly leaf lettuce, mesclun mix with baby arugula, red endive or radicchio, red leaf lettuce, watercress. Lime wedge > lime zest sprinkled on top before rolling. Rice > jasmine rice, multigrain rice, saffron rice, wild rice, other grain (barley, quinoa, e.g.). Shrimp the same (it’s hard to improve on grilled shrimp). Steak (skirt or hanger) > filet mignon, roast lamb. Filet mignon and wild rice burritos with shredded gruyère and [leftover] beluga lentils. Grilled shrimp burritos with romaine and arugula, green rice (parsley), gruyère and dilled sour cream. Grilled salmon, with dilled rice, sour cream, salmon caviar and [leftover] yellow lentils. Have whatever burrito you like, but definitely have a burrito. Where would be be without them?